This will be a quick review of Desk App – an app I wanted to like, especially after seeing it as a sponsor on Daring Fireball and reading some positive comments about it from someone on the Seanwes Community. I didn’t buy it right away, partly because while so many of the reviews seemed positive, there were just enough negative comments that mentioned basic flaws that I waited until I saw it go on sale in the Mac App Store. I’m glad I did, because I can’t use Desk App for the reason I bought it – writing and publishing blogs posts – unless a basic flaw is addressed. I’m not going to spend time telling you what I like about the app, other than to note is is pretty, mostly gets out of the way when I like to write, and has a developer who is doing a great job at being transparent about his journey as an indie developer. I wish him luck with it, and if he can fix a few things about his app, I can see myself using it all the time. For now, I could use Desk App as a text editor, but frankly, I don’t need a Markdown-compatible text editor. I use Byword for that on both iOS and OS X, and I have both nvAlt and BBEdit around as well. I’ve longed for a nice blog editor for the Mac for a while. I bought, upgraded, and still ocassionally use MarsEdit, and while it works fine on the blog publishing side, I kept finding inconsistiences, especially with font sizes and types when using it. I tried editing and publishing from Byword for a while, but didn’t care for its publishing workflow, so I just use it to compose a post, publish a draft to WordPress, and use the online editor to fine-tune and place pictures. My idea workflow for writing and publishing a blog post is to treat is just like any other kind of document. Start writing, save the draft periodically, review it, then flip the post from Draft to Published. Seems simple enough – type, save, type some more, save, type, save, review, publish. I’ve worked like that in MarsEdit for years, and when I choose to only work within the online WordPress editor, I do the same thing. Desk App doesn’t allow me to work that way, however. Every time I save, or rather send a post to WordPress as a draft, a new draft is created. Every single time. Here are some screenshots to show you what I mean. So I typed that, then sent it to WordPress as a draft. During that process, I also selected a category for the post – Site Business. I now have two drafts, and that’s just for the test post I worked with for the purpose of this review. A week or so ago, I saved several versions and ended up with quite a few more drafts. In addition to that, I lost the category I’d set the first time. Each of those drafts also ends up with different permalinks as well – because as far as WordPress is concerned, they’re all different posts. This seems like such a basic thing to get right, that I wondered if I was just doing something wrong. That doesn’t seem to be the case, as someone else reports the same issue recently on the Desk App community forum. I suppose I could try to work around this issue. I’m doing it for this post right now, as a matter of fact. I’m writing it in Desk App, saving locally to my Dropbox folder. I’m going to to publish to WordPress as a draft one time when I’m done, then review the post and flip it to published using the online editor. But I’m not interested at this point in changing a workflow that has worked fine for me before just to deal with a quirk of this still new app. I hope the developer addresses this issue soon. If he does, I’ll spend more time with Desk App to more fully evaluate it as both a blog editor and text editor. Having completed another 30 posts in 30 days blog challenge in August/September, I decided well in advance of November that I would do another 30 day challenge as my own way of kind participating in NaNoWriMo – or National Novel Writing Month. I’ve never written a novel or anything approaching novel length, preferring to stick to poetry or at most short stories, so I figured committing to cranking out another 30 blog posts in 30 days would be my way of demonstrating I could be disciplined about writing at least something, if not every single day, then 30 discrete posts in a 30 day timeframe. At about the same time, some other folks in the virtualization community, and specifically in the Virtual Design Master community, decided to take up the 30 day blog challenge as well, having been inspired by Greg Ferro’s post titled – I Challenge Me And You To 30 Blogs in 30 Days. So I had two good reasons to do this, and lots of interesting people to keep me motivated. Quite a few of the folks whose blogs I already followed participated in this challenge, and I was introduced to many new people I’m now following, both via Twitter and their blogs. If you’re looking for new people to follow, I’d strongly suggest you check out the recap post. Thanks to all who participated, and thanks especially for the encouragement and kind words as I worked on my own 30 (now 31) posts in 30 days! I have a bit of a fascination with streaming video gadgets. That’s partly due to me being a geek, but more practically related to the fact that we cut the cable/satellite cord in our household in April of 2011. We never watched much current television anyway, and most of what we did watch amounted to DIY/HGTV reality TV garbage, and one day it hit me that we were paying $92 per month to DirevTV for the ability to watch and record The Daily Show and a geek staples, and nothing else. I had owned a Roku HD for about 6 months, having picked one up on Woot, So I discussed it with my wife, told her I thought we could survive on Netflix streaming, OTA HD, and iTunes Season Passes for the shows we couldn’t wait for on DVD or Netflix. We committed to giving it 6 months, and I had my doubts as to whether we’d make it. Here we are, 3.5 years later, and I can’t imagine paying $100/mo for the cable or satellite TV again. Since 2011, I’ve acquired a few more streaming devices. I’ve owned an Apple TV 2nd generation, and still own and use an Apple TV 3rd generation, a Roku 2, two Roku 3’s, and I even used a Mac Mini as a Plex client for a while. I ran my 2nd generation Apple TV jailbroken for a while so I could run XBMC, but ended up selling it on eBay for more than the cost of its replacement 3rd gen Apple TV. Today I have the Roku 2 at my office, a Roku 3 on our tiny living room TV (bought purely so any potential babysitter could watch TV there), and the Apple TV and Roku 3 connected to our primary TV in our bedroom. I also have a Tivo HD with lifetime subscription connected to that TV but powered off most of the year, and I just disconnected a Playstation 3 that I intend to trade in for credit towards an Xbox One. I’m using the HDMI port from the PS3 on the back of my soundbar/sub combo (don’t hate me) for a new device – the Amazon Fire TV Stick. 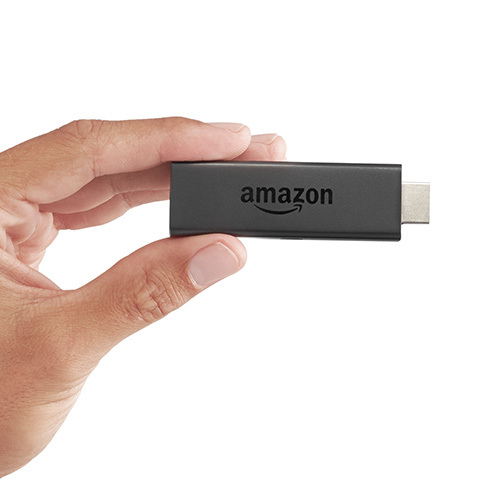 Amazon announced the Fire TV Stick a month or so ago, with pre-orders set to begin arriving around mid November. my wife and I managed to order a couple during the day they were announced, and as Amazon Prime members, we got ours for $19 each instead of the regular retail price of $39. My wife’s should arrive sometime in December, but mine got bumped up to Black Friday, so I redirected it to my parents’ home in middle Tennessee. I’d considered getting my parents either a Roku 3 or Apple TV for a while now, but wasn’t sure if they’d really use it. I figured if the Fire TV Stick works out, one of ours could make a good starter streaming device for them, and potentially be all they’d need. On Black Friday, we returned home after taking our son and his cousin to a local kids play area called “Bounce Palace”, and I found the Fire TV Stick waiting in the mailbox. Amazon continues to do a good job with the out of box experience – clearly borrowing a page from Apple’s playbook. The Fire TV Stick comes in a box about the size of the one that both the Roku 3 and Apple TV come in, which may seem a bit large for something the size of a USB flash drive, but it also contains several other components to connect it to a TV and power it. Inside the box are the stick, the remote, a small USB power adapter, a long USB to Micro USB cable, and an HDMI extender adapter, presumably for TV’s with too little room to accommodate the stick in between other connected HDMI cables. I tried to use the Fire TV Stick by connecting its USB cable to the USB port on my parents’ TV, but the stick complained when it booted up, saying I’d get a better experience using the included adapter, so I did. Once booted up, the first thing the Fire TV Stick needs is to be connected to a WiFi network, which went smoothly enough. The next thing it asked me to do was download a software update, which I did. I have no idea how long that took, because we went to dinner after about 20 minutes of watching the progress bar barely move. I worried that the slow download might mean we were in store for a poor experience over my parents’ fairly slow U-Verse connection, but some of my Twitter pals confirmed the download was slow for them over their very fast connections. When we returned from dinner, we found the Fire TV Stick updated and asking if I wanted to use the Amazon account which had been used to order it. This is one thing that Amazon does really well – every Kindle or Fire device arrives ready to use and already associated with your account. Once I confirmed I wanted to use my account, the Fire TV Stick played a welcome cartoon video that gave a brief overview of the stick and the uses to which it could be put. We mostly ignored this because it’s hard to focus on much of anything besides getting a two year old and five year old into the house and settled into playing, but I was pleased to see that video and more were available for replay later. After explaining to my dad that this was a device for watching online video, his first question was, “So you can use it to watch YouTube on the TV instead of the computer?” Check. His next was, “Can I get rid of cable if I have this?” I told him that was a much harder and more complicated question to answer, but in my case, yes, I had, although given his love of sports and many other types of TV shows, I kinda doubted it. I showed him YouTube, which worked quite well, even over their fairly slow (4Mbps or so) internet connection. I signed into my Netflix account, and it also worked quite well. I added an “NFL Now” app and that experience was terrible – near constant buffering and the audio never successfully synced up with the video. There wasn’t that much left to show him, which was good, because at that point my son ran into the room demanding to see something they had recorded on their U-Verse DVR. Ironically, once we switched back to the DVR, we discovered my dad had deleted the show, a Curious George Christmas special, but they settled for Frosty the Snowman. We could have watched both via the Fire TV Stick and Netflix, of course, but my goal wasn’t to take over my dad’s TV that night. After we returned to Knoxville, I disconnected my PS3 and connected the Fire TV Stick in its place. After dancing with the stick and the required network switch, I browsed the popular apps and downloaded and installed Plex. This would have cost me something, maybe $1.99, but for some reason I had 500 Amazon Coins, and I was able to use them to pay for the app. Once Plex was installed, I signed in with my Plex credentials and it recognized that I was a Plex Pass subscriber. I fiddled with the settings in the Plex client in an attempt to make it look as clean and sparse as I have it on my Roku and iOS devices, mostly to no avail. I guess this is the way Plex looks on Android, and if so, I’m not a fan. Still, I managed to turn off the most annoying thing – theme music, and started testing. I didn’t adjust any quality settings, either in the Plex client or in the Fire TV Stick, so it ran at whatever the default is. I was quite pleased with the performance over my 802.11N network, especially given my Airport Extreme is sitting two floors below our bedroom. It does remind me I need to pay someone to finally run Cat6 up to the top floor and place an AP up here to improve things overall. Using Plex, I streamed both 1080p and 720p MP4 rips of my own blu-rays (honest), and they looked fine. They might look a bit better on the Roku 3, but I wasn’t in the mood to do an A/B frame-by-frame comparison. Suffice to say, I’d be satisfied with the quality, but with a 40 inch TV and a soundbar for audio, I’m not an AV nerd. I also tested it with some other random MKV files (no idea where they came from) and they looked quite good as well. After trying it with Plex for a while, I tried several videos from both Amazon and Netflix, and the experience was exactly what I would expect – very good. I noticed a slight bump in quality and a near elimination of buffering when I recently upgraded our U-Verse internet service from 12Mbps to 24Mbps. If I thought the quality would get better by moving to 45Mbps, I’d do that, but I’m pretty sure it wouldn’t. As far as video quality goes, I’m really impressed with the Fire TV Stick – especially for $19. I’m going to show a picture I snapped of my TV screen here. It looks kinda crummy, but I want the visual. I was a little surprised but very impressed that Amazon includes not just a single overview tutorial video, but a series of 10 of them, covering such topics as troubleshooting and remotes and controllers. I certainly don’t need these videos, but they’re not meant for me; they’re meant for people like my dad or my family and friends who don’t eat, breathe, and sleep streaming video gadgetry like I do. I think both Roku and Apple would do well to include something like this in their devices as well. Aside from very good streaming video performance, I found maneuvering around the Fire TV Stick to be a little cumbersome, although to be fair, I’d bet most people will get their major services activated and only use them in the Recent menu after that. Browsing for apps and games was a bit frustrating, especially the additional network or cable TV apps. Most, if not all, require some sort of sign in proving you have a paid cable subscription, which is fine, but I’d rather just turn all that crap off like I have on my Apple TV. As it was, I tried a few, discovered they all required sign ins, then removed them from Recent and will have to remember to go back and uninstall them. All the games I saw cost money or coins, and while I have a couple hundred Amazon coins left after paying for Plex, I had no desire to use them to demo what may be terrible Android games. I’ve saved my biggest potential beef with the Fire TV Stick for last. See that picture? That’s a selection of remotes – some of which I don’t use, along with the main remote I do use for everything in my AV setup – the Logitech Harmony 600. The 600 isn’t the fanciest Harmony Logitech makes, but I’m done paying $200 for a remote that will inevitably die. The 600 controls more devices than I need it to, and it lets me program one-touch activities for my wife and son, and at $50 or so, that’s all I care about. I have one in the bedroom, one in the living room, and an Xbox-branded version of it in the basement, waiting for a TV to replace the giant RPTV I gave away recently. Next to the Harmony is the Roku 3 remote – which I never used until very recently, when I discovered its ability to let me listen to sound via its included headphone jack meant I could walk on the treadmill in our bedroom without worrying about keeping our son from falling asleep. Counting from the right is a Fitbit One, included purely for size, and an old school Apple remote. I’ve never even used the remote that came with my Apple TV, as I programed my Harmony to work with it as soon as I unpacked it. 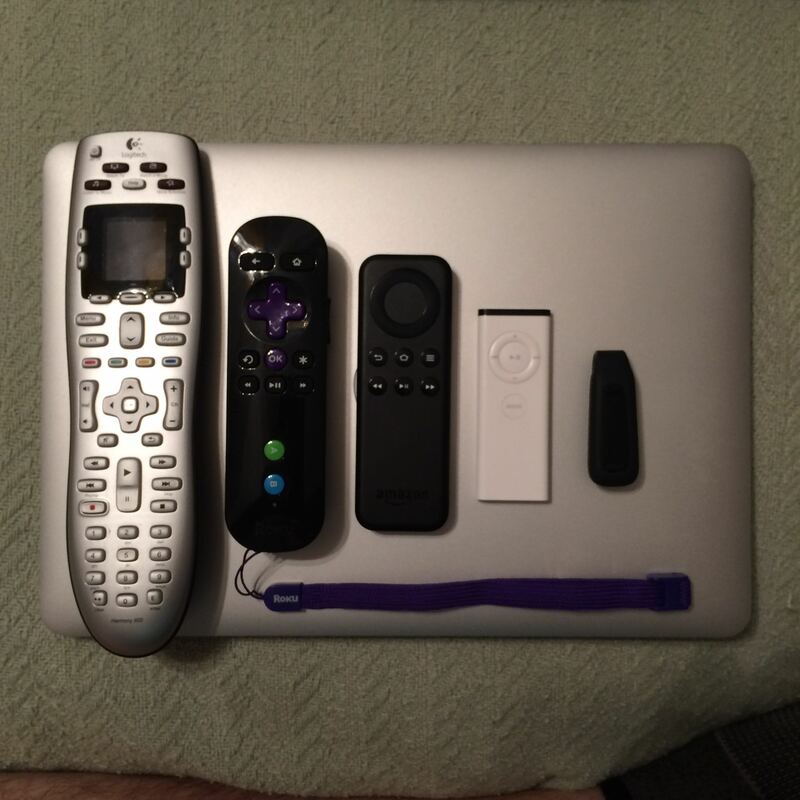 In the middle is the Fire TV Stick remote. And like it or not, I will be using the Fire TV Stick remote, because it operates via Bluetooth and not infrared. I guess it makes sense, given the likely location of the stick, but it also means I can’t use my Harmony remote with it. I have a USB infrared adapter for my PS3 that enables me to use my Harmony, but I doubt there will be anything like that for a $39 streaming stick. So until or unless I can find a Harmony remote that does IR and Bluetooth, I would be stuck using a separate dedicated remote for the Fire TV stick. That’s a no-go for regular home use for me, which is fine, because my Roku 3 does everything the Fire TV Stick does. For travel use, however, a dedicated remote is fine, and I can see myself keeping one of these sticks in my backpack, with all its parts in a ziplock bag, for use on the road. I’m not sure how having a separate remote will impact my parents when I give them the other stick, but we’ll see. That’s all for now. If you have any questions you’d like me to answer about the Fire TV Stick, hit me up on Twitter at mikestanley. This post will serve as a quick update on our first couple of months worth of deployment data for our Zoom video conferencing service. I explained our decision to move to a cloud-based system in general and our choice of Zoom in this post. We announced the availability of the service in early September, but other than holding a pair of official online training sessions for it, we’ve allowed the service to grow organically, depending primarily on word of mouth to get the word out about it so far. The easiest way to demonstrate how popular Zoom has become already is to compare the data we have on Zoom’s usage since we announced it to Polycom usage for the entire calendar year of 2013. So in just two months, we already have four times as many people hosting their video meetings via Zoom, for 3.7 times as many meetings. Why so big a difference? The biggest reason has to be convenience, and not just location convenience since our H.323-enabled conference rooms are still being used to join Zoom meetings, but scheduling and ease of use as well. Our users, particularly our administration and leadership, host Zoom meetings for many of the same reasons they always have – department meetings, faculty meeting, project meetings. I’d say we’re seeing an uptick in those types of meetings simply because they’re so easy and convenient to hold and don’t require participants to pack up and go to a dedicated H.323-enabled conference room to join. We’re also seeing increased usage for distance education. One of our departments was an early adopter of Zoom, before our public launch even, and they’re hosting a class multiple times each week with participants all across the state. We have graduate students hosting Zoom meetings for their thesis committees with remote members from other institutions. Our Tennessee Extension unit hosted its quadrennial conference early this month. While over 800 attendees participated in the four day conference, quite a few members were able to join in from many locations around the state as both the general sessions and several breakout sessions were broadcast webinar-style via Zoom each day. We’re a state-wide organization, with over 2000 employees located across all 95 counties in Tennessee. We have project and leadership teams beginning to use Zoom who simply never had the option of meeting via video before. While I expect our usage numbers to continue to accelerate, my gut tells me that as we leverage Zoom more, we will spend less on travel – be it lodging, mileage, or food, as well as fees for external conference call systems. I’ll post more data as I have it, especially at the six and twelve month milestones. One of the major projects on my plate right now is the design and implementation of System Center Configuration Manager. We’ll be piloting it on campus first, with the goal of eventually extending its use to manage computers and devices at all of our locations across Tennessee. Given that we have offices in all 95 counties, 3 regional offices, 10 research centers, and a large presence on the Knoxville campus of the University of Tennessee, this system will be critically important to improving how we manage our IT infrastructure across the state. I met with some colleagues from the University of Tennessee at Chattanooga at TechEd this year, and had a brief discussion over dinner and cider of their SCCM implementation. So I knew I wanted my team to meet with them before we start scoping and planning this project. We rented a van from the UT motor pool and headed to Chattanooga Wednesday morning. In addition to myself, along for the ride were our security analyst, 2 IT professionals from our College of Veterinary Medicine, and a colleague from the College of Education who is planning on standing up his own SCCM system for his department. Project Plans, Personnel, and Timetables – Oh My! We met with the two systems folks running UTC’s SCCM system, including the guy who pushed for the project and got the support for it from their CIO. It was impressive to see that they went from conceiving the project in January of 2014 to its initial deployment in their computer labs in March and April, and that included bringing Microsoft in via a Premier engagement to both scope the system and come onsite for a 3 day jumpstart. The UTC folks brought Microsoft onsite twice, in fact – for 3 days to help build the system and do a tiny bit of focused training, and after 6 months had passed, for 3 days to help review the progress the UTC folks had made and verify that they had built the system out according to established best practices. It was also interesting to find out that while UTC built their SCCM system within the existing statewide Tennessee Active Directory, where each campus has its own child domain, they have decided to stand up their own separate AD forest and migrate the system and computers over to it. We don’t even have our own child domain at this point, but have considered setting one up. Seeing the benefits and flexibility having their own forest will provide to UTC, it’s something we have to keep in mind moving forward. Another valuable data point we gathered was the number of folks working on the SCCM system at UTC. They have two admins of the system, although one noted that his duties, primarily application packaging at this point, accounted for about 50% of this time. The other admin noted SCCM took significantly more than 50% of his time, but as the system is beginning to mature, and as he is able to delegate permissions within the system to departmental IT professionals, he anticipates that percentage to decrease. That was both good to hear and a little scary, because I’m the only dedicated infrastructure person on my team, so I’ll be bearing most of the high level duties for the system myself, and delegating administration of unit-specific functionality to others. We had a great meeting with our UTC colleagues, wrapped up with lunch at a great Chattanooga restaurant called Universal Joint that I reviewed on Geek Food Critic. I’m still digesting much of what we discussed, and am more excited than ever to setup a proof-of-concept system. I’m also beginning to work through SCCM self-paced training at Microsoft Virtual Academy, as well as Pluralsight. I’m also on the lookout for good blogs and even in-person training, so if you can suggest any, please reach out to me over twitter at @mikestanley. I took and passed the Citrix 1Y0-300 exam today. That fulfills the upgrade path requirement to convert my Citrix Certified Enterprise Engineer (CCEE) certification to the new Citrix Certified Professional – Virtualization (CCP-V) certification. My current role doesn’t even involve working directly with Citrix products, so it would be reasonable to ask, “why bother upgrading a certification that doesn’t impact my current job?” I can think of some good reason. I put a lot of work into obtaining my CCEE. I had to pass 4 separate exams to achieve the CCEE, and I’m proud of the work I did. While my CCEE is valid until sometime in 2016, the single exam upgrade path Citrix provided to the new certification may be expiring on Nov 28 of 2014. I say may be expiring because the wording isn’t clear and I think Citrix may well extend the perceived deadline. I wanted to prove I could do it. My current boss doesn’t care one bit that I passed this exam and upgraded my Citrix certification, and that’s OK. I care, though, and I did it at least in part because I wanted to prove that even though I stepped away from building and maintaining Citrix systems last year, that my lab time and interest in the products were enough to keep my edge. I don’t know what tomorrow will bring. I like what I’m doing now. I like my team. I like my boss. I love working in higher education. I may stay where I am for a long time. But I simply do not know what the future holds. A little over a year ago, I left a job with a VAR working with a great team of guys, primarily because I got spooked as a new father at frequent travel away from my little boy. Funny thing is, since I work for a state-wide organization now, with offices in every county of the state, I do as much, if not more travel than I used to. But I’ve grown as a father just as my boy has grown into a toddler, and while I don’t relish being away from home, it doesn’t break my heart the way it did before. Nobody is responsible for keeping my skills up to date but me. If I want to keep my skills fresh, it’s up to me. I get to work with a lot of different technologies right now, but because we’re such a small IT shop, I don’t get to go as deep into some of them as I’d like. So work in my home lab and pouring time into Pluralsight courses are ways I can learn new things and go deeper into them. So that’s why I took this exam and upgraded my certification. I did it for me, if not for today, then for whatever may happen in the future.